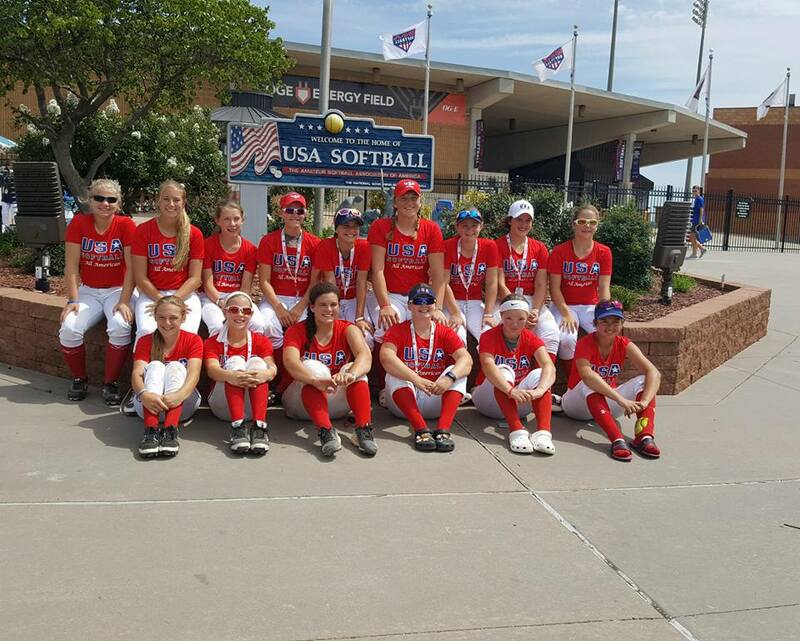 Kids from Ohio and West Virginia had the opportunity to go through tryouts in June and 15 young ladies were selected to represent our region in OKC with 23 other teams from across the country. Only 360 athletes from across the country were selected to participate. After having 3 full team practices, we made the 15 hour bus trip to OKC. We left Wednesday night and drove through the night on a bus with kids and parents and arrived in OKC on Thursday afternoon. At check in on Friday kids got a goodie bag that included 2 USA jerseys and 2 t-shirts. We then had a photo session and were scheduled for a practice on the stadium field. Friday afternoon kids were able to participate in a Softball Factory Clinic, toured the Softball Hall of Fame, got autographs from USA national team members including Crystal Bustos and Sue Enquist, and then participated in opening ceremonies. Afterward players were able to participate in team challenges. It was a long day but very educational and inspirational for the athletes. The opening ceremonies were incredible with all the teams on the stadium field listening to a very inspirational talk from Sue Enquist. I have heard Sue talk many times before and she is always great, but this was special. It even gave me goosebumps. Thursday we played two pool games. We won our first game 4 – 0 against a team from the northeast. We then played a team from Texas that went on to win the tournament and lost 9 to 0 after having a bad first inning. We held our own after the first inning. They were put together like a college team and took advantage of our nerves. Their pitcher had a great combination of speed and movement and offensively had tons of speed and power in their line up. They were very impressive and played the game at a much faster pace than what our teams in Ohio are used to. As the second seed in our pool we played another Southwest region team Sunday morning. We played better but still lost 3 to 1. That team went on to lose to the first Texas team we lost to in the semi-finals. It ends up we faced two of the best teams in the event. It was very much a growing experience for these athletes and their families. I was able to do some of my mental training with them and they saw first hand how important the mental side of the game is. I wish we would have gotten a chance to play teams from other areas besides the southwest but playing against the better teams in the tournament allowed us to see what we need to improve on for the future. If Ohio is going to be able to compete at a national level, we need to get our best kids trying out and be able to have more practices throughout the summer leading up to the event. The southwest region had 300 kids tryout and it was apparent that some of the teams there had been together for awhile. everyone who participated was impacted in a positive way with new friends, great memories, and pride for being a part of the inaugural event.